5:00 pm - 8:00 pm - Registration Pick up registration bags and late registration. 8:00 am - Continental Breakfast for registered regatta participants only. Located near the registration tent/gazebo. 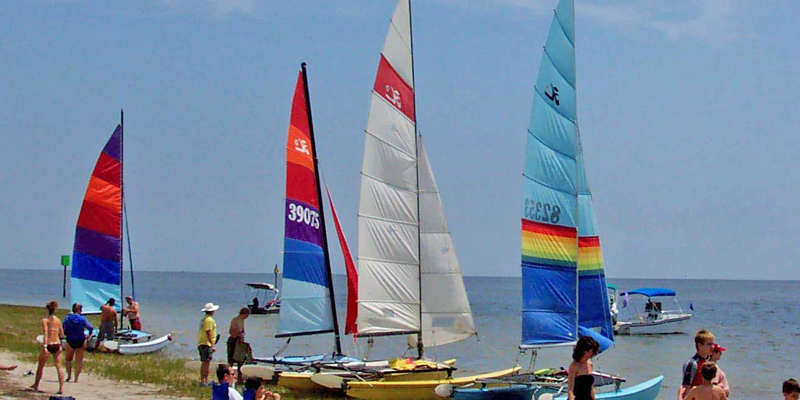 8:30 - 10:30 am - Register to sail, windsurf or as a guest participant. Look for the tent/gazebo at the beach. 11:0 am - Skippers' Meetings Skippers meet at the stage to get the skinny on where and when to race. 11:00 am - 3:00 pm - Concessions Open Burgers, dogs, grilled sandwiches, sodas, bottled water and more. 12:00 Noon - Boat and Windsurfer Races Watch the big boats cruise out to their courses and pick your favorite windsurfer to cheer for. 6:00 pm - 7:30 pm - Dinner by Posey's at Apalachee Bay Yacht Club A fresh local shrimp dinner (chicken also available) for participants. Non-racing participants can purchase dinner tickets separately or with their registration package. 8:30 am - 10:00 am - Continental Breakfast for registered regatta participants only. Located near the registration tent/gazebo. 9:30 am - Windsurfer Skippers' Meeting Day two of racing starts for the windsurfers. 1:30 pm - Awards Ceremony Trophies will be presented beach-side to the winners in all racing categories. SILENT AUCTION Silent Auction Winners announced at conclusion of Award Ceremony. GENERAL AUCTION Live General Auction begins at conclusion of Award Ceremony. Bidding on the beach, bring your chair! Items range from artwork to boating gear and everything in between. Youâ€™ll have a great time and it raises money for an important cause.